A sign identifying a pipe as a point for treated combined sewer and wastewater sits along Chattanooga Creek Wednesday, August 8, 2018 in Chattanooga, Tennessee. The smell of raw sewage is overwhelming at certain spots along the creek. A sign warns of sewage contamination as Chattanooga's stormwater system overflows into a culvert on Dixie Drive on Wednesday, April 25, 2018, in Chattanooga, Tenn. Heavy rainfall brought flooding and overflows to many parts of the region. 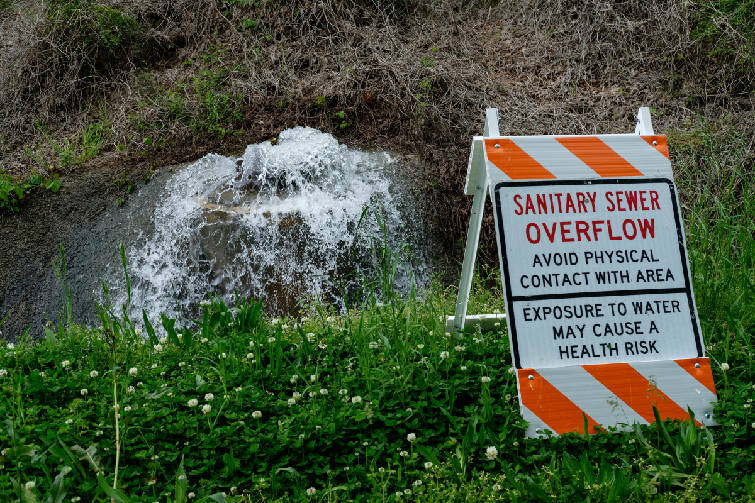 Millions of gallons of sewage-tainted stormwater runoff flows through Hamilton County's creeks and into the river that provides water to the Tennessee Valley. When there's heavy rain, more waste either spills from the county's sewer lines into people's yards and streets or entirely bypasses the system and freely flows through parts of the county. The county's sewage system is falling apart in some areas and was underbuilt in others. Now, citizens and county officials are left to deal with the mess. It's the center of a yearslong problem for the county that was largely ignored for decades. "I would argue sewage is the No. 1 aquatic pollution problem in the Chattanooga area," Tennessee Riverkeeper founder and executive director David Whiteside said. The organization has monitored the area's sewage problems since its inception in 2009. It works to hold polluters accountable and force cleanup that meets federal regulations. Last year, the foundation sued the Hamilton County Water and Wastewater Treatment Authority, which operates the county's sewer system, for illegally discharging more than 20 million gallons of sewage from the Signal Mountain wastewater treatment plant into the Tennessee River. The problem is now staring the county in the face, and it's going to come with a hefty price tag: $245 million over about 20 years. WWTA is negotiating a consent decree with the Environmental Protection Agency that would require a system overhaul to meet Clean Water Act standards. "Is it true we have overflows? Yes," said WWTA executive director Mark Harrison. "But is it true our sewer systems are 70 years old and should just be taken out to pasture and forgotten? No. They need to be repaired and cared for. We are still better off than we were before the Clean Water Act." This isn't a problem unique to the Chattanooga area. It's one taking shape across the U.S.
Knoxville and Memphis have sewage problems. Nashville upgraded its system but grew faster than anticipated, and now that area has sewer issues again. Roads, schools, buildings and sewer systems built during and after the Industrial Revolution now need replacement or major repairs nationwide. It's how WWTA leaders explain what's been going on with the sewer system. "No one wanted to spend the money on the maintenance or didn't think it was necessary," WWTA board chairman Mike Moon said. "We are now in deferred maintenance, and this is where we are today. It's no different than issues we are seeing with our schools and roads." Harrison compares sewer upkeep to the electric grid. Companies adequately priced the electric grid for years, which allowed the system to grow and be maintained, he believes. However, electric bills generally far exceed sewer costs. For Harrison, that shows communities across the U.S. didn't adequately invest in the maintenance of its sewer systems. If customers want the sewer system to match the functionality of the electric grid, they have to start paying for it. "Now, that's not popular, but it's true," Harrison said. "I don't think it's healthy for WWTA to be the scapegoat for something that's been going on for 70 years," Harrison said. "We've managed some of these for 10 to 15 years when the problem was already 50 years old." Some residents believe it's time to combine the city and county's sewer operations and sell them to a private business with experience running sewer systems. Tennessee American Water has expressed interest in purchasing WWTA. "If a third party can run things at the same cost or less, it's a win financially for ratepayers," said county resident Brent Smith, who with a group of vocal neighbors persuaded county commissioners to stop WWTA from building a sewage treatment plant on Mahan Gap Road. "There's got to be a better option," Smith said. "If a third party comes in and says it can come in and do this, that's a win. A private party might be more efficient when it comes to fixing things and having repairs done on time." "It's important that we don't play the blame game with people who have tried to make good decisions for the community," he said. "To me, the better approach is for the community to understand we have a problem we are trying to address, and we need their support, understanding and some time to get it right."